While other goalies participating in the World Cup have revealed the mask they will be wearing, Team Canada’s Carey Price has options. On Tuesday, CCM Hockey unveiled the second of two different masks the Montreal Canadiens goaltender will be wearing when he represents Canada at the eight-team international tournament. While the first mask is primarily black and white with some red accents, the second mask is red and white — the traditional colors of Canada’s national team jersey. Price will be joined by goaltenders Braden Holtby (Washington Capitals) and Corey Crawford (Chicago Blackhawks) for Canada at the World Cup. Given the amount of talent at this position, Price is not a lock to be the starter for the team, although he is seemingly the favorite to win the role. At the 2014 Winter Olympics, Price backstopped Canada to a gold medal after posting a 5-0 record and two shutouts in the tournament. 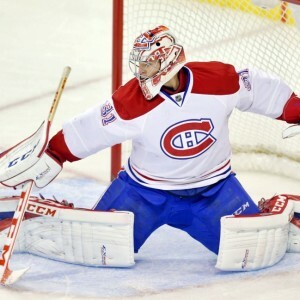 Price’s 0.59 goals-against average and .972 save percentage helped earn him the Best Goaltender Award. While Price had been dominant at the NHL level before the tournament, many considered his performance at the Olympics his unofficial leap into the game’s elite at the goaltender position. After winning the Vezina and Hart Trophies for his performance during the 2014-15 season, Price played in just 12 games in 2015-16 due to an MCL sprain in his right knee. For Price, the World Cup gives him the opportunity to represent his country again on the international stage and show the world he is back to 100 percent. The World Cup takes place from Sept. 17 to Oct. 1 in Toronto.